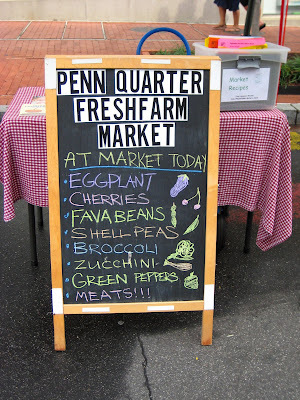 Yesterday I left work a bit earlier than usual and walked to the Penn Quarter Freshfarm Market. I did not really have anything particular I wanted to buy: I just wanted to stroll around, see what was there and sample some stuff (LOVE free samples). By the time I arrived at the market, it was full of people, despite the hot and sticky weather. I did what I usually do at markets: walk through, see what's out there and then make a second/third/fourth walk-through and decide what to get. Below: "the scene" and also the orchid booth! 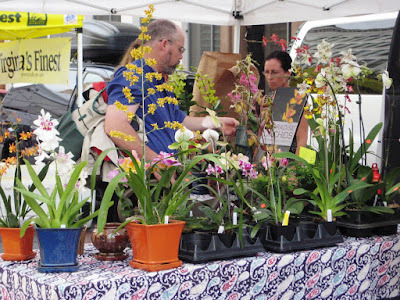 This booth gets me in trouble quite often, as I absolutely love orchids. But this time I restrained myself and did not take any of these beauties home. Ok, don't feel too bad for me: I have 4 orchids at home, and one at work: it's just that none of them are currently blooming. 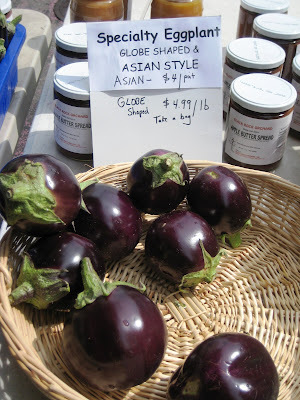 Then I saw the cutest mini eggplants at the Mountain View Farm stand. I just thought the price was a bit over the top. Instead, I bought a basil plant ($2) and a bunch of beets ($3.5o) from them. After getting home, I replanted the basil plant into a bigger pot and really hope it will survive for a while. Then what made me really happy was seeing tomatoes! Remember, last time there were none to be found. 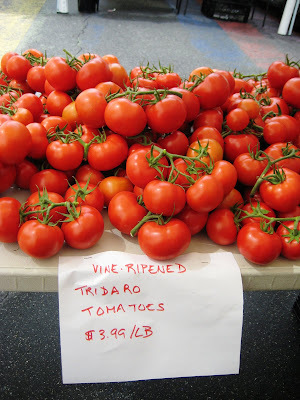 I bought a bunch of tomatoes from Toigo Orchards stand ($5). 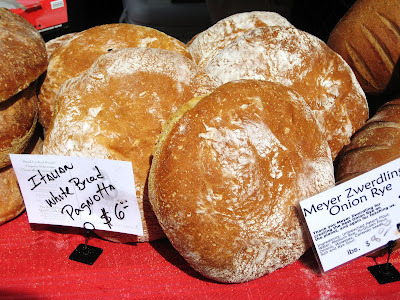 I also could not resist buying bread (bought 1/2 of white Pagnotta = $3). But look at the other gorgeous creations they have! Well, how could I go home with tomatoes and basil and not buy mozzarella? I stopped by at the Blue Ridge Dairy Co booth and bought a container of fresh mozzarella. It was no longer on sale like the last time, but I decided to splurge ($7). All in all, I spent $20.50 and am very pleased with my purchases. Stay tuned to see what I cooked up with my buys from the market. 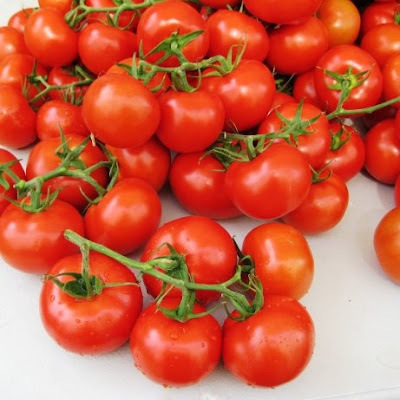 Question: what have you recently bought at your local farmer's markets? And what did you cook with your purchases? Aren't markets fab? Love those breads, I am a sucker for any kind of bread product! Last farmer's market I want to was in Barcelona, everything we bought (fruit, sandwiches etc.) we just ate right there. We travel a great deal. I may miss the latest boutique but I never miss a market :-). We are kindred spirits. Have a wonderful weekend. 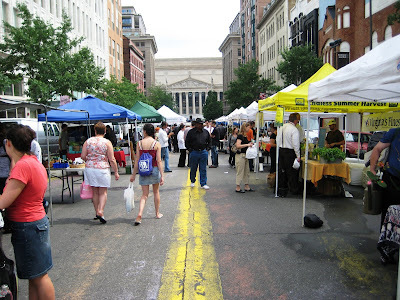 Farmer's markets are a great way to feel a sense of community and connection to the earth...as well as the place where the market is held. I would've loved going to that farmer's market! 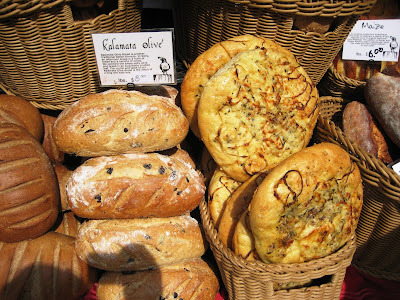 Beautiful & inviting pictures: those breads & foccacio's look so tasty! I love farmers market! I find something new everytime I visit.